How Many Homes Are Insured? How Many Are Uninsured? Q: On your web page, you report an ORC International poll for the I.I.I. found that 95 percent of homeowners had homeowners insurance. How many homes does that represent? A: The short answer is about 70 million. And as is so often the case, I took a long route to it. The 95 percent is the percentage of people who said they own a home and then answered “yes” to the question of whether they have homeowners insurance. We regularly survey about 1,000 people on this topic, and around 94 percent to 96 percent generally answer yes. In the poll, we do not define what a home is, so it could be single-family home, a condo, a co-op, a duplex or anything else. In addition, there are several different types of homeowner policies, but the survey doesn’t ask which type they have. The I.I.I. designed the survey, and we doubt the typical consumer knows off the top of his head whether they bought, say, a dwelling fire policy or an HO-3, so we don’t ask. The answers would not be meaningful. The National Association of Insurance Commissioners (NAIC) collects information on all types of homeowners policies. To muddle things a bit, one of those “homeowners” policies is really renters insurance. In 2012, the most recent year available, there were 68.6 million policies for the various types of homeowners policies or their barebones brethren, dwelling fire (not counting the renters insurance I just mentioned). As a reasonableness check (and because I felt like it), I created a separate estimate by using U.S. Census data from the American Community Survey (factfinder.census.gov). The table is C-01-AH, if you want to look it up yourself. According to that source, there were 75.65 million owner-occupied year-round housing units in 2013, both single- and multi-family. (There are another 4.07 million seasonally occupied homes.). Multiplying the 75.65 by the 95 percent with insurance leaves us with an estimate of about 72 million homeowners policies covering primary residences. Comparing the estimates: they measure two different years, 2012 and 2013 but that discrepancy isn’t critical. The number of households doesn’t vary too much from year to year. More significant: the latter estimate is indirect; it smashes together numbers from two sources (Census Bureau and I.I.I. poll). So it is probably less accurate than using the NAIC data, even though the NAIC data is older. However I find it reassuring they came to approximately the same number. That’s why 70 million seems a reasonable estimate. Q: Thank you for your quick response. I appreciate the background/explanation. I was actually trying to determine the number of homes that are uninsured (the 5 percent). Based on your calculations below, 5 percent of the 75.65 would be 3.78 million, correct? Lots of homeowners facts and statistics at the I.I.I. website. The 2016 U.S. presidential election is one of the rising political risks facing businesses and investors in the year ahead, according to Marsh’s Political Risk Map 2016. Terrorism and struggling emerging economies, such as China and Russia, are also among the growing political risks businesses face. Marsh notes that the recent terrorist attacks in Paris and San Bernardino, California have intensified political rhetoric and brought foreign relations and defense policy topics to the forefront. Marsh observes that in the last decade multinational organizations have undertaken unprecedented international expansion, leaving them exposed to global credit and political risks like never before. And those risks–including terrorism and political violence, armed conflicts, increasingly powerful anti-establishment political movements, and persistently low commodity prices–continue to grow. Against this backdrop, it’s critical for businesses to be prepared for the possibility that political violence, unrest, or other large- scale crises will quickly develop in virtually any part of the world – including those countries that were historically seen as safe or stable, Marsh says. Companies can prepare for these risks by managing their credit risk, building resilient supply chains, protecting their people and by protecting their assets through insurance. Marsh’s Political Risk Map 2016, with data and insight from BMI Research, presents country risk scores for more than 200 countries and territories, helping businesses and investors make smarter decisions about where and how to deploy financial resources–including risk capital–globally in 2016 and beyond. As if we needed another reminder of the rising threat of cyber attacks, the estimated EUR 50 million ($55 million) loss arising from a cyber fraud incident targeting Austrian air parts supplier FACC AG made us sit up and take notice. As Bloomberg reports here, if the damages do indeed amount to $55 million this would be one of the biggest hacking losses by size. Bloomberg also points out that the incident is made more intriguing because FACC is 55 percent owned by China-based AVIC. It will take time for the details of this attack to emerge, but in a January 20 press release, FACC acknowledged that the target of the cyber fraud was the financial accounting department of FACC Operations GmbH. The company also noted that its IT infrastructure, data security, IP rights and the group’s operational business are not affected by the criminal activities. Further, FACC said the $55 million in damage was an outflow of “liquid funds”. “The management board has taken immediate structural measures and is evaluating damages and insurance claims,” FACC added in its third quarter report. According to this report by ComputerWeekly.com, the fact that FACC’s financial accounting department was targeted in the fraud is prompting speculation that the company was likely the victim of a so-called whaling attack, also known as business email compromise (BEC) and CEO fraud. These sophisticated phishing attacks are when cyber criminals send fake email messages from company CEOs, often when a CEO is known to be out of the office, asking company accountants to transfer funds to a supplier. In fact the funds go to a criminal account. Last year, the Federal Bureau of Investigation (FBI) described BEC fraud as an emerging global threat. Since the FBI’s Internet Crime Complaint Center (IC3) began tracking BEC scams in late 2013, more than 7,000 U.S. companies have been targeted by such attacks with total dollar losses exceeding $740 million. If you consider non-U.S. victims and unreported losses, that figure is likely much higher. 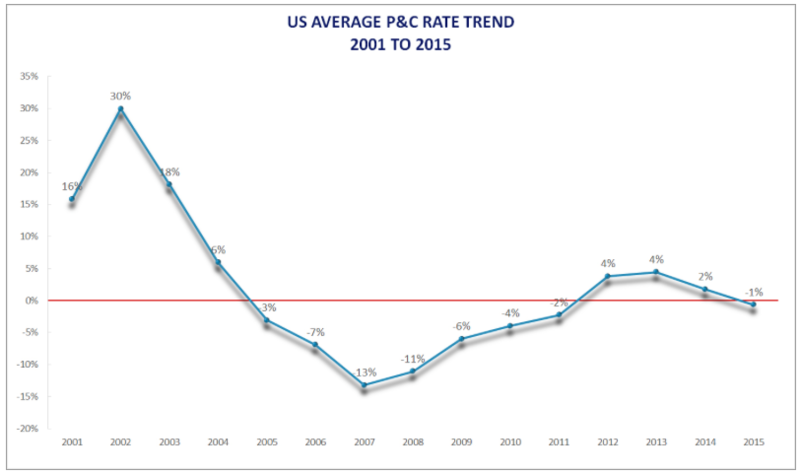 The rising incidence of BEC and CEO fraud and its intersection with cyber insurance will form the topic of a future blog post. Both the WEF Global Risks Report 2016 and the Allianz Risk Barometer 2016 have identified cyber attacks and incidents among the top risks facing business. Find out more about cyber risks and insurance in the I.I.I. white paper Cyber Risk: Threat and Opportunity. Cyberattacks are now the greatest risk to doing business in North America, according to the just-released World Economic Forum’s (WEF) Global Risks Report 2016. 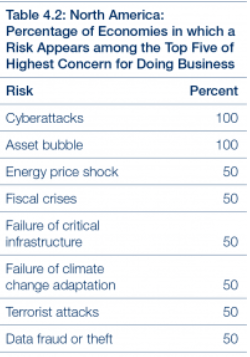 In North America, which includes the United States and Canada, cyberattacks and asset bubbles were considered among the top risks of doing business in the region. The WEF noted that in the United States, the top risk is cyberattack, followed by data fraud or theft (the latter ranks 7th in Canada, which is why it scores 50 percent in the table below). The risks related to the internet and cyber dependency are considered to be of highest concern for doing business in the wake of recent important attacks on companies, the WEF observed. On a global scale, cyberattack is perceived as the risk of highest concern in eight economies: Estonia, Germany, Japan, Malaysia, the Netherlands, Singapore, Switzerland, and the United States. Public sector bodies in at least two of these countries have recently been disrupted by cyberattacks: the US Office of Personnel Management and the Japanese Pension service, the WEF noted. Defining clear roles and responsibilities for cyber risk within corporations is crucial, the WEF noted. Outdated laws and regulations also inhibit the ability of governments to capture criminals, but also to expedite the often lengthy procedure of implementing legal and regulatory frameworks to reflect evolving realities. Check out the Insurance Information Institute’s latest report on cyber risks here. Environmental pollution stories seem to be dominating the headlines and with this comes renewed awareness of potential environmental liabilities among companies, municipalities and their (re)insurers. An ongoing gas leak at the Southern California Gas Co Aliso Canyon natural gas storage facility near the Porter Ranch suburb of Los Angeles, has forced thousands of residents to evacuate, many of whom have been experiencing health problems. The Los Angeles Times reports that so far, the gas company has spent more than $50 million to combat the methane leak that began October 23, and more than 25 lawsuits have been filed against the utility. A securities filing last week stated that the cost of defending the lawsuits, and any damages, if awarded, could be significant. Those insurance policies are understood to have a combined available limit in excess of $1 billion, though legal experts suggest the ultimate costs could run much higher. Meanwhile, officials in Flint, Michigan, made a cost-saving decision to switch the source of their drinking water to the Flint River from Lake Huron in April 2014, a move that has exposed thousands of children to dangerous levels of lead. While the city has since switched back to Lake Huron water, and started distributing water filters and bottled water to the city’s residents, The New York Times reports that many have called for state money to replace Flint’s aging pipe infrastructure (at an estimated cost of $1.5 billion) and a fund to address any developmental impact on children. Last week Michigan governor Rick Snyder declared the city to be in a state of emergency just as federal officials opened an investigation into the water contamination. Other environmental pollution stories in the news include one lawyer’s fight against DuPont’s decades-long history of chemical pollution and further away the recent Samarco dam burst in Brazil–described as the worst environmental disaster in the country’s history. In a recent note AIG Environmental Insurance said that environmental pollution continues to be a major source of concern for the (re)insurance market. AIG noted that the potential environmental liability impact of the Samarco dam burst remains the unknown factor, with market sources putting the overall insured coverage at in excess of $600 million. This is just one of many questions that can be asked of an Amazon Echo, our smart home companion that arrived over the holidays. And as I’m finding out, the part-Siri part-bluetooth speaker that can stream music, tell me the weather or what the traffic’s like, can also be integrated with our smart home devices and hubs. Turning on the lights, locking the doors and changing the temperature at home are all possible once Alexa is introduced to compatible products and hubs. As Internet of Things (IoT) devices proliferate and debut at CES 2016, the world’s largest technology trade show happening in Las Vegas this week, insurers will be taking note. A new International Data Corporation (IDC) report estimates worldwide spending on the IoT will grow from $699 billion in 2015 to nearly $1.3 trillion in 2019–at a 17 percent compound annual growth rate (CAGR). While insurers have already explored the benefits of connectivity in the auto insurance sector, the connected home represents a major opportunity for property/casualty insurers, according to a report by Accenture. Security, energy management, lighting, water, thermostats, weather, appliances, and smoke and fire are the major areas within the connected home where insurers have the potential for improving underwritten precision and limiting losses while strengthening customer relationships, Accenture says. However, insurers will also need to tackle challenges presented by large inflows of new data such as customer indifference or lack of understanding of new offerings, as well as privacy and regulatory concerns, to convert that opportunity into profitable growth, Accenture notes.